Integrity Mold is a leading supplier of custom injection molding and tooling services for customers with highly engineered plastic components. Founded in 2005 and headquartered in Tempe, Arizona, Integrity Mold serves customers across diverse end markets, including the medical, consumer durables, transportation and construction industries who share high standards for excellence in product quality, precision engineering, production efficiency and on-time delivery. 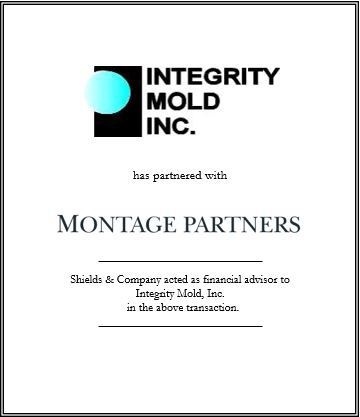 Montage Partners invested in Integrity Mold in December 2015 in a recapitalization in partnership with the Company’s founders and management, which included providing capital for Integrity to accelerate investments in state-of-the-art equipment and talented team members that will support the Company’s continued growth. Shields & Co. represented and advised Integrity Mold in the above transaction.